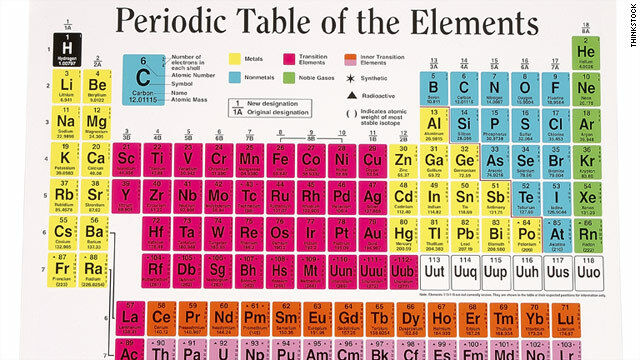 Remember memorizing the periodic table in high school? Well, forget it. Some information on the table is about to be reset. The world's top chemists and physicists have determined that the atomic weights of 10 elements - ones you've actually heard of - need to be expressed as an interval (or range) rather than a static number, Science Daily reports. The new atomic weights of hydrogen, lithium, boron, carbon, nitrogen, oxygen, silicon, sulfur, chlorine and thallium will more accurately reflect how those elements occur in nature. "For example, sulfur is commonly known to have a standard atomic weight of 32.065. However, its actual atomic weight can be anywhere between 32.059 and 32.076, depending on where the element is found," the article explains. The change will take effect in 2011, designated by the United Nations as the International Year of Chemistry, according to Science Daily. No word yet from CBS on whether the changes will require major rewrites of upcoming episodes of "The Big Bang Theory."